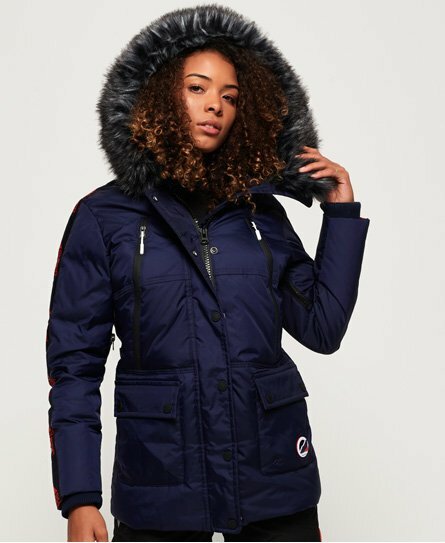 Superdry women’s Canadian Mountain Range Down parka jacket. This premium après jacket has an 80/20 premium duck down filling and a low down fill power rating, making it an ideal jacket to help keep you warm in the colder months and offers great insulation. This jacket has been designed with coated zips and pit zip venting to keep you dry and cool. The Canadian Mountain Range down parka also features a removable faux fur trim, a single zip fastening with poppers, a zipped inside pocket and four external pockets. For the finishing touches, this jacket has been completed with ribbed cuffs, Superdry taping down each sleeve, a Superdry badge on the pocket and branded Superdry poppers and zip pulls.